Welcome back to the Diablo 3 Beta review site. Today we are going to review crafting as it is right now in the beta. In order to craft, you have to unlock artisans who do the actual crafting for you. To begin crafting you have to do couple of simple quests to unlock the blacksmith. First, talk to Deckard Cain. He will send you to talk to the blacksmith. He is in a bind, and needs a favor. Pretty straightforward, you head down to the “Cellar of the Damned”, and kill his wife who has turned into a undead. Afterwards, he asks for yet another favor. He needs the crown of Leoric found in the Chancellor’s Tomb. Upon finishing these two quests, he is grateful, and will offer crafting services for the player. Now that crafting is available, you will need recipe’s and mats. Most of the recipe’s are trained directly from the blacksmith, but some of them are found in dungeons. To train the blacksmith for more recipe’s you will need Pages of Training. 5 of these combine into a Training Tome. These Tomes are then traded along with a few gold to advance his skills. Currently there is 10 levels that can be trained, and each level will take 5 tomes. Training starts out at 500 gold. Once the diablo 3 beta blacksmith reaches level 2, then training will cost 1000 gold. Level 3 is 1500, and level 4 is 2000. This may change as it gets closer to the release of D3. So now the blacksmith is properly trained, we need mats (Materials) for crafting. These are obtained from mobs, as well as breaking down items into mats using the Nephalem Cube. Common items break down into Common scrap, and magic items into subtile essence and often common scrap as well. Rare’s will break down into a Fallen Tooth, and a Legendary into Petrified Bark. Once you have obtained mats (and lots and lots of gold), you are ready to begin crafting. Head to the blacksmith, and open up the crafting window. To craft, it is as simple as clicking on the recipe and then craft. For an example of what is requred to craft, Apprentice Leather Cuffs requre 6 scraps, 4 essence, and 220 gold. When you hover over the recipe, it will tell you what you will receive. In this case, the Diablo 3 Apprentice Leather Cuffs have 10 armor, 5-7% chance of finding magical items, and 1 random property. So the item you will make will nto be the same every time. Each of the attributes will differ slightly. It has been rumored, that they might even add the quality of the craft at a later date to make even more exceptional items. So that is crafting in a nutshell. 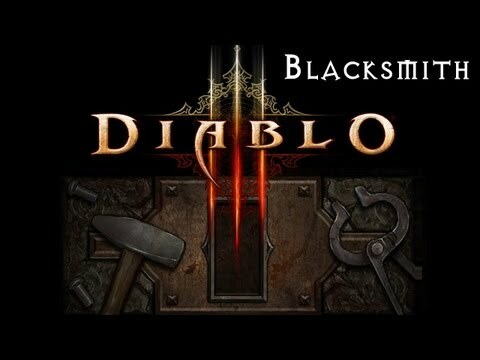 Stay tuned for more Diablo 3 Guides, Diablo 3 Cheats, and other Diablo 3 information.